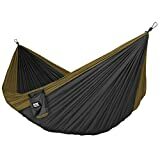 -, Backpacking, Beach, camping, Double, For, Hammock, Lightweight, Neolite, Nylon, Parachute, portable, Straps, Travel, Yard. Holding up to 400 lbs., the Neolite Double Hammock allows room for one or two people and is made with high strength breathable nylon that will always dry quickly. It also includes tree friendly straps, ropes and carabiners for easy setup. High grade triple interlocking stitching means the Neolite will hold up to years of use and abuse. An integrated stuff sack makes packing up fast and simple. Fox Outfitters Neolite Double Hammock is the perfect hammock for camping, backpacking or travel. Easy to setup, extremely compact and ultra lightweight. Two solid steel carabiners and two extra tough 5 ft 6 inch nautical grade hang ropes with tree friendly rope sleeves are included for quick and easy set up. Hang ropes pack inside a separate stuff sack for easy storage. Unfolded Dimensions: 10 ft 6 in (long) x 6 ft 6 in (wide); Packed Dimensions: 7 in (tall) x 5 in (diameter); Weight:19 oz; Maximum capacity of 400 lbs.